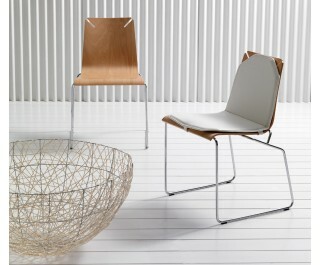 Stacking chair in chrome-plated welded steel wire. Shelve in curved natural beech, available also lacquered in different RAL colors. Cushion upholstered with fabric or leather. New products have being created thanks to the decennial experience of Esedra in the furniture field. Established after years of activity as craft workshop, specialized in the production of tubular steel furniture, Esedra has today created a mix of craft tradition and technological innovation. With its own corporate heritage and its strong identity Esedra entered the market as one of the Italian leader in the production of modern furniture. Essential lines, care in details and finishing as well as particular attention to the expressive possibilities of material combinations are the main characteristics of the new products.